How does a talented quilter who also loves animals combine her two passions? Years ago, Nan Baker of PURRFECT SPOTS decided to form her company for a special feline who inspired her, and to form a special cause to help animals at the same time. I sat down with Nan and was almost moved to tears when I heard the story of Casey. Nan also has some killer tips for getting organized so you can find more time to sew and for quilting in general. QW.com: How did you come up with the name “PURRFECT SPOTS” for your quilt pattern company? NB: When I sold my first design, it suddenly became crunch time to pick a name. I wanted something that spoke of my two passions – needlework and animals. 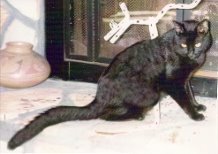 As a disaster responder for The Humane Society of the United States for Florida and the rest of the country, I went from designing to disasters and I started my company in memory of my kitty, Casey. I had to tie the two together. While petting one of my kitties, I kept going over different names. I just wanted it to be the perfect name. Rina had a very loud purr and her motor was really going that night. It just kind of came to me – PURRFECT and because I love Dalmatian dogs – SPOTS. Therefore the name stuck and it could be anything – no limitations. At the different needlework markets my company name and my other profession gave me a wonderful opportunity to educate shop owners about The CASEY Plan (explained later in this interview) plus I offered brochures for their shop. QW.com: What are your best-selling patterns? What are your personal favorites? NB: My best selling patterns include Memphis Ribbon & Blues, Night Watch, Bullas Bears, and Splendour in the Grass. My two newest patterns Ruffles & Ridges and The Point of It All are looking very promising to be big sellers as well. Also my cross stitch patterns are still selling as well, particularly my Christmas animal series. It is difficult to pick a favorite quilt because they all have different meanings for me and I remember what was going on in my life when they were made. 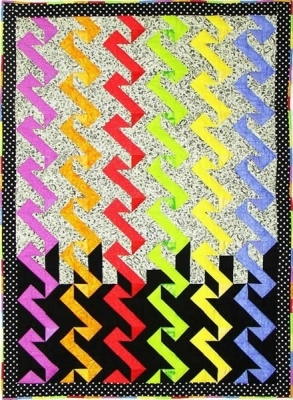 Having said that, I would have to pick “Denny’s Hopscotch Quilt”. This was a hand pieced and hand quilted quilt that I made for my husband. He loved it, but so did our cat, Denny. Finally my husband had to relinquish the quilt to the cat! 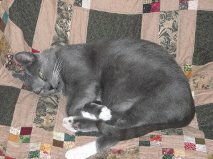 Denny loved that quilt and spent hours on it napping. It brings back fond memories of a very special kitty when I see that quilt. RIP my dear sweet Denny. QW.com: Tell us more about The CASEY Plan and how PURRFECT SPOTS supports that cause? 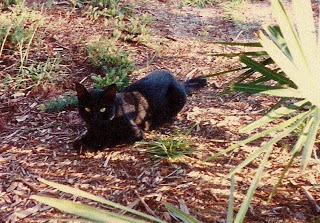 NB: PURRFECT SPOTS was started because of Casey – a very special cat. He was a stray cat that hung out at the house next door. The owners were military and were deployed. He was not their cat but he just found a place to call his own where he wasn’t bothered by anyone. When I discovered him, I started feeding him every day, but couldn’t get near him. When we had to evacuate for Hurricane Opal, I took all my kitties with me except for Casey as I couldn’t find him and if I had, I don’t think I could have caught him. After Hurricane Opal hit and we returned to our house, I ran next door and Casey came running to me and practically jumped in my arms. Thank God, he was not injured, just scared. He became my cat. Unfortunately as he was a feral cat, he hadn’t had the proper nutrition and had lots of medical problems. I lost him all too soon, but I am so glad that he had a loving home his last few months. When he died, I decided his life should not be in vain, so I started The CASEY Plan (Caring for Animals Safely in Emergencies during the Year). As a member of the State and National Disaster Animal Response Team, I knew all too well what happened when pets were left behind in disasters. The CASEY Plan was a way to educate people how to make preparations for their pets in times of disaster. The CASEY Plan won an award from the state of Florida and also a National Award from The Humane Society of the United States. A portion of sales from PURRFECT SPOTS goes to support that effort. QW.com: Many of our readers tell us they have trouble finding more time to sew. What advice would you give them? NB: This is the hardest thing for many of us, including me. There are always distractions, but I have learned to make time and set boundaries. I am blessed in that I have a sewing studio otherwise known as the C.A.T. House – Creative Arts & Textiles (but the kitties use to live there). Having this space, I can just close the door and start where I left off the next day. I know this is a problem for those who don’t have space as it is time consuming to take everything down and then set it up when you want to continue on your project.Sometime you don’t feel it is worth the effort because by the time you get it together, your sewing time is gone. Again, you just must make your sewing time a priority for many reasons. QW.com: Other than quilting, what else do you like to do? NB: I love to help animals and try to find ways to do that whether it is making Kennel Quilts for animal shelters or writing blogs for animal organizations. I love cross stitch and almost any kind of needlework as I do needlepoint, crochet, knit and of course sewing for my home or dresses for my nieces. I also like to garden and decorate my house whether it is a re-arrangement of furniture or holiday decorations. 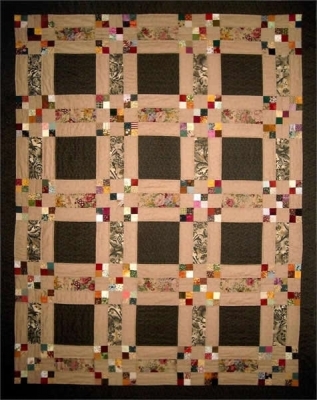 QW.com: What are some of your favorite quilting tips? NB: I keep my projects organized as I am usually working on three or four at a time. I have boxes where I keep all the fabrics, directions, etc., for each project. I have found that it is easiest to do all my cutting first so when I have a few extra minutes, I can just start sewing. I print a copy of the block and tape or pin my fabric in the proper place so I can get right to work without having to review the project. I keep a pair of scissors in my glasses case along with a couple of tapestry needles as the needles have big eyes. I use these when I pull my threads through after quilting. As I need my glasses to sew, I find it is very handy to have the other items next to me. My ironing board is set up next to my machine and when I turn on the machine, I plug in the iron so it is ready when I need it. I heard someone once say – “My day is not complete until fabric, thread and needle meet.” We need to make this a priority and we will be much happier which will be reflected in our actions and attitude. This entry was posted in Designers, QuiltWoman and tagged Nan Baker, Purrfect Spots, quiiltwoman.com. Bookmark the permalink.